Named for their place of origin, the Nova Scotia Duck Tolling Retriever comes from Canada. They are more commonly known these days as ‘Tollers’ or ‘Duck Tollers’. As the name again suggests, their main purpose as a gundog centres around waterfowling. Tollers are often used in groups. Primarily their focus is to lure geese and ducks into range of a hidden shotgun, then retrieve the fallen birds from water. Their waving white tipped tail is believed to help attract the waterfowl. They have a thick, water repelling, double layered coat, which enables them to stay warm whilst working. This pretty retriever has a very distinctive look. The coat ranges in colour through reds and oranges, often with small white flecks. Their ears are almost triangular in shape, off-set by their small but muscular bodies. The Kennel Club describes this breed as being of medium size, with a medium length coat. As such they do require regular grooming – especially when they have been out working! 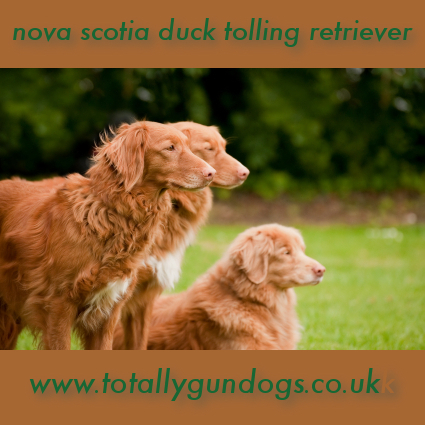 If you are interested in learning more about the Nova Scotia Duck Tolling Retriever, why not check out the UK Toller Club website. This is nice simple overview of the breed. After two years of owning a toller, I would add that while they are great family dogs, they are also very smart. They thrive if they have work, but are likely to be trouble if they are just a house dog. We have also found them to be very versatile. At age 2, our toller has titles in obedience, agility and hunting. I would warn, however, if you are interested in using a toller for hunting, to be especially attentive to its breeding. Tollers can be very uneven when it comes to their hunting drive. However, they can be excellent retrievers…we know because our little girl has all the drive of a lab. She whizzed through her AKC Junior hunt title with straight passes and is now in training for Seniors. So, I highly recommend this breed…but don’t bring home a toller unless you are willing to give it the kind of active and engaging environment it needs!